Notes: The title of this true-life book caught my attention. It raises up images of Anne Frank and other books about those who struggled through the Holocaust. 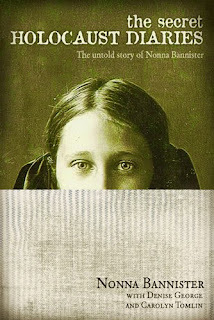 The author, Nonna Bannister, was a Russian survivor of the Holocaust who never told her stories until she opened up about them to her American husband in the 1980s. Nonna had apparently kept diaries during the Second World War, and had continued to keep diaries even afterwards, and in the 1990s she put together her writings concerning the Holocaust. Knowing multiple languages, she even did her own translations. However, she made her husband promise that none of her writings would be made public until after her death. Sure enough, she passed away and her writings on the Holocaust were published. Also of interest, Nonna survived not only Nazi Germany, but apparently her family was somewhat well to do and she survived Lenin's Russia. Mini review: In some ways, this might seem to be a tragic story. This woman lost everything, including her family members one by one. But she persevered. She pushed on. To her knowledge, she was the last surviving member of her family, which had been quite a large family. She eventually came to America, married and started a new family. It could be heart breaking, but she did not let the pains of her life and the atrocities she witnessed keep her from loving. She must have been some lady. As for the book itself, I was intrigued by the first half or so which focused upon her earlier days in Russia only a generation or so after Tolstoy's death, and I've had some interests in Tolstoy. The second half of the book focuses upon her ordeals during WWII and the Holocaust, and there were several instances in which she survived but by all rights probably should not have. A miracle? Maybe. She likely would have seen it that way, at least to some extent. An interesting read. Glad I discovered it. Notes: I've been reading some myth-related material of late, including fables, so I thought I'd check out what a modern author does with similar literature. I have to admit, I'm a bit skeptical when it comes to modern Christian literature because I'm often disappointed by what I consider an overly simplistic viewpoint of spirituality and the world in general, but I'm willing to give a writer who is new to me a chance. Funny thing, I don't usually feel this way about 19th Century and earlier Christian writings. That earlier literature doesn't make me feel like I'm being sold something, but that I'm exploring spirituality with the author. I wish and hope more modern religious authors would take a similar approach. Maybe this one will. Mini review: A cute story, and for the most the religious aspects were not annoying. 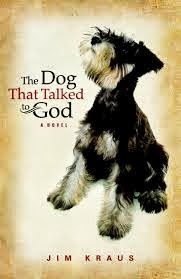 I really liked the talking dog, Rufus, but I never felt much for Mary, the protagonist. Mary never felt real to me, but was only a character. I think part of the reason I felt this way is because I thought there was too much exposition early in the story, too much telling me about Mary instead of allowing me to learn the character by experience and emotion. Also, I felt Mary's struggles with spirituality were somewhat simplistic, though I freely admit this could just be me as I have a tendency to try and intellectualize matters of spirituality, though I realize many people do not. Mary was not a detestable character, but I never felt drawn to her, and I did feel she was a little overly judgmental in a few instances. Now that I've griped enough about the main character, I would like to add that I thought the over all plot was a nice change of pace from other Christian fiction I've read, and that the story did not lead in overly obvious directions. As a writer myself, and a former newspaper journalist, I admit to being somewhat jealous of Mary toward the end of this book with the trail she ultimately blazed with her life. 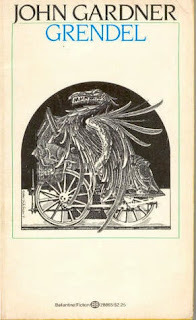 Notes: A number of my readings of late have been related to myth, fairy tales and fables, so I thought I would continue this trend a little longer by turning to one of the original authors of fables. 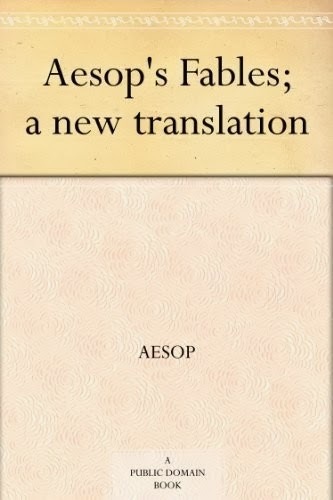 Or, at the least, Aesop is one of the earliest whose writings we still have. I have read or am aware of many of these short tales, mostly from my childhood, but there are also a number here with which I'm not familiar. Most of these are quite short, perhaps making Aesop one of the first flash fiction writers. Also, though this is titled a "New" translation, it actually was first published in 1912. Mini review: Some of it's corny, some of it funny, some of it fairly serious, but there was a lot of simple wisdom to be found here in a common sense sort of way, a lot of it even appropriate today, more than 2,000 years after Aesop put together this collection. Upon reflection, my guess is Aesop probably didn't create most of these, though I guess it's not impossible that he did; I'm assuming he probably collected these fables from a variety of sources, sort of like some writers do rural tales today. Notes: Since I just finished another book by this author, I thought I'd re-read Grendel, one of my favorites from Gardner. This is quite likely Gardner's best-known novel today since his passing in a motorcycle accident more than 30 years ago. I first read this novel for a college class on existential philosophy more than 20 years ago, and then a few years after that I read it again. But that's been quite a while ago. I remember the book being quite dark, almost nihilistic, yet showing a certain genius in it. If you're not familiar with this short novel, it is basically the re-telling of the first part of the Beowulf saga but from the point of view of Grendel, the monster and Beowulf's first foe in the saga. Mini review: I'd forgotten just how deliberate this novel is. Every line, every paragraph, perhaps every word, has intent. Allusions galore reign here. Allusions to Beowulf, obviously, but also allusions to Aristotle, Plato, numerous philosophers and philosophies, religion, the zodiac ... it's almost too much, and is breathtaking in its own way. All while being a fairly easy read and not a boring read. This might be the most literary of any literary novel ever written, or at least that I've read. Still, while I highly regard this book, it doesn't quite make it into one of my favorites. I have to sit and think why this is, and some reasons come to me. For one, there is some stream of consciousness writing here, and while I can appreciate such, it is not something I enjoy. Also, I felt the plot was a bit ... untimely? Is that the word? What is the opposite of serendipity? An unhappy accident? I'm not sure, and much more thought will have to be given on this. Still, though not quite a favorite novel of mine, it is well worth reading, especially by anyone who prizes philosophical fiction writing, because this is perhaps the best there is. 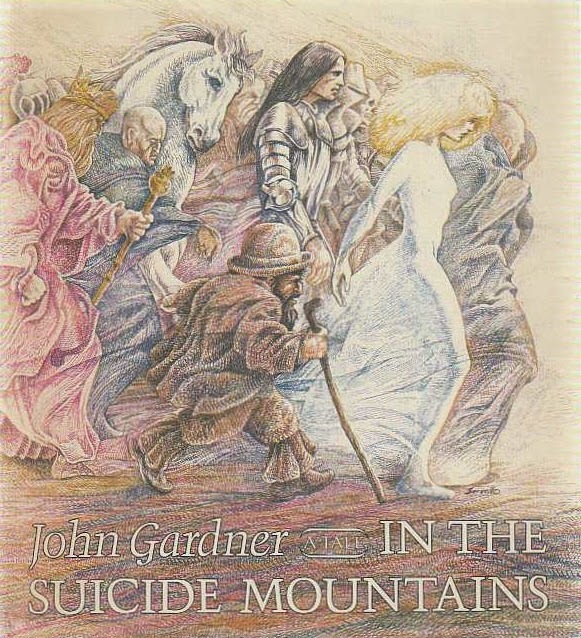 Notes: The late John Gardner is an author whose approach to fiction I much appreciate. He was considered something of a philosophical writer, though what I've read of his has not been dry and boring, for those who might fear such concerning philosophy and writing. This particular book is apparently a children's book, including much artwork, but it begins with quite the dark topic: a dwarf and some other adventures decide to end it all by going into the mountains. This is their tale. I very much look forward to it. Mini review: Above I called this a children's book, but by today's standards it is likely more of a young adult tale. In the Suicide Mountains was originally published in the late 1970s, and it seems to me children's literature back then was a bit darker than what we generally think of it as today, but perhaps my memory is hazy as I was a child myself then. Anyway, this was quite the cute story, though it did have it's darker elements. The artwork was quite good, and I felt it fit the story perfectly. This was basically a modern fairy tale of sorts, with a few quirks of that genre. There's a knightly prince who doesn't want to be a knight, a maiden who doesn't want to be a maiden, and a dwarf who doesn't want to lose his temper. Then there's the infamous six-fingered man who is the main villain, though he's not the same six-fingered man from the movie and novel The Princess Bride (just in case you were wondering). And, of course, there's a dragon. 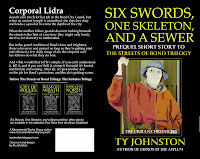 My short story Six Swords, One Skeleton and a Sewer is now available in print for $3.99. Being only 46 pages, I would offer it for a cheaper price if I could, but $3.99 is as low a price I can go and still make any profit whatsoever, something like 25 cents per copy. 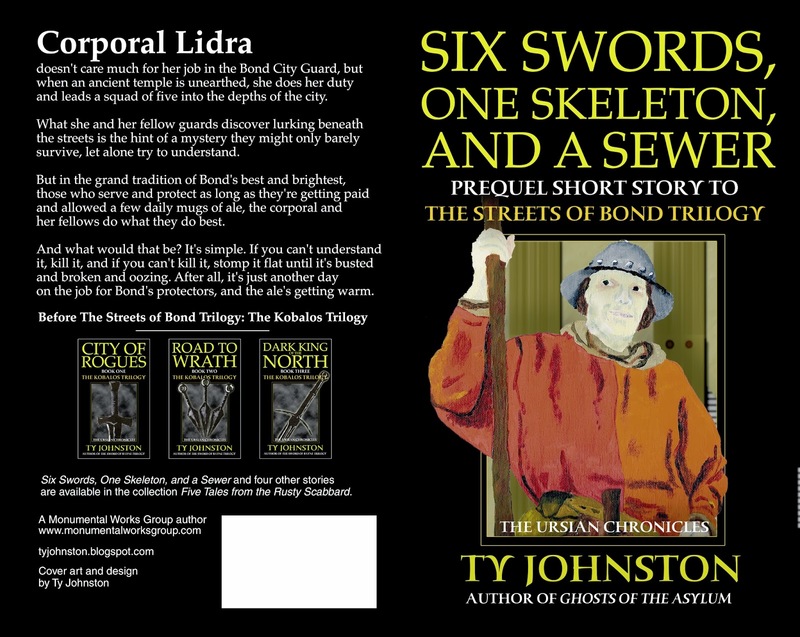 I'd like to add that, though this short story has been available for some while, it is actually an introductory tale to my next Ursian Chronicles trilogy, The Streets of Bond Trilogy. And to tell it like it is, my novel Ghosts of the Asylum is actually the first novel in that trilogy while my novel Demon Chains is the second of the trilogy. The third novel will be titled The Company of Seven. So why am I just now making it known these are part of a trilogy? For a few reasons. First, the third book hasn't even been started yet, though I hope to finish it and make it available this year after I work through some other writing commitments. I didn't want readers to start thinking I'm George R.R. Martin, taking years to write the next book in a series, so ... well, I've been hesitant to make such an announcement. Also, the truth is the short story and the two novels stand on their own as individual stories, and do not have to be read as part of a series or trilogy. That was intentional. The novels in my earlier trilogies have been dependent upon one another for the reader to have the whole tale, but this time I wanted to take a different route. I guess I didn't have to tie in all these tales as a trilogy, but there are certain elements among them that are related. And then, of course, there is my wider, larger Ursian Chronicles, of which these tales are just a small part. Believe it or not, I do have long term goals for the Ursian Chronicles. My world of Ursia is more than just a backdrop to stories I want to tell. In the end, the Chronicles will be a series of trilogies, short stories, serial fiction and the rare novella or novelette. As of right now, I have no plans for individual novels within the Ursian Chronicles, but that might change as I experiment with different ways to tell a story (or a portion of a larger story, in this case). Notes: This book is supposedly the final part of the longer story that is known as The Once and Future King, which I just finished reading. 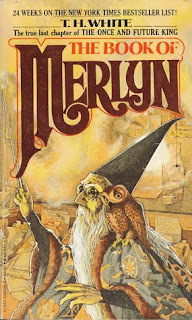 The novel that is The Book of Merlyn for some reason was not included with the printing of The Once and Future King in the 1950s, but was eventually printed separately in the 1970s, years after the author's death. Why this text was not included with the original novel, which is made up of four shorter works, is beyond me at the moment, though I'm sure notes I see at the beginning of The Book of Merlyn will inform me. Mini review: This book has quite the different tone than The Once and Future King, so I can see how an editor might have cut it out, though some portions of this novel actually do appear in The Once and Future King early on during Arthur's education under Merlin. There is mostly a lighter tone here, though in the end this is a philosophical novel looking at mankind's penchant for violence, especially war. This could almost be a children's book, if not for the serious overtones towards the end. Also, where The Once and Future King had a darker ending, this novel has strong hints of a better future for Arthur and for mankind. There is little doubt the author was influenced by the world in which he lived, Europe during wartime. "The best thing for being sad," replied Merlin, beginning to puff and blow, "is to learn something. That is the only thing that never fails. You may grow old and trembling in your anatomies, you may lie awake at night listening to the disorder of your veins, you may miss your only love, you may see the world about you devastated by evil lunatics, or know your honour trampled in the sewers of baser minds. There is only one thing for it then -- to learn." Merlin to Arthur: "You have become the king of a domain in which the popular agitators hate each other for racial reasons, while the nobility fight each other for fun, and neither the racial maniac nor the overlord stops to consider the lot of the common soldier, who is the one person that gets hurt." Elaine to Guenevere concerning Lancelot: "Yes, he is mad," she said. "You have won him, and you have broken him. What will you do with him next?" Arthur: "Long ago, when I had my Merlyn to help, he tried to teach me to think. He knew he would have to leave in the end, so he forced me to think for myself. Don't ever let anybody teach you to think, Lance: it is the curse of the world." Arthur: " ... when a moral sense begins to rot it is worse than when you had none." Sir Lionel to Arthur: "You know," he said, "it's all very well to take up with morals and dogmas, so long as there is only yourself in it: but what are you to do when other people join the muddle?" "Funny," said Lancelot, "how the people who can't pray say that prayers are not answered, however much the people who can pray say they are." "But women are cruel in this way. They do not accept excuses." 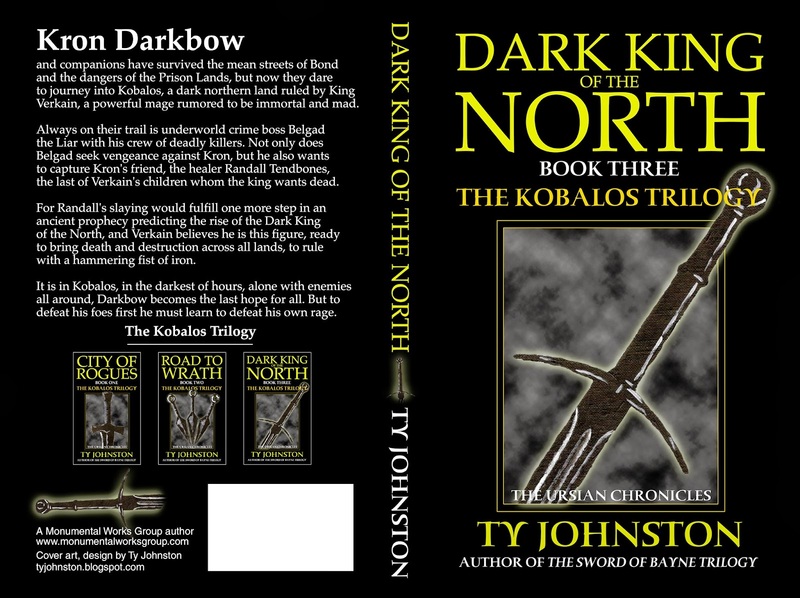 Dark King of the North: Book III of The Kobalos Trilogy is now available in paperback. So what are you waiting for? Get out there and buy a few hundred copies! 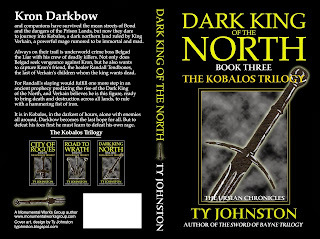 Kron Darkbow and companions have survived the mean streets of the city of Bond and the dangers of the Prison Lands, but now they dare to journey into Kobalos, a dark northern land ruled by King Verkain, a powerful mage rumored to be immortal and mad. Always on their trail is underworld crime boss Belgad the Liar and his crew of deadly killers. Not only does Belgad seek vengeance against Kron, but he also wants to capture Kron's friend, the healer Randall Tendbones, the last of Verkain's children whom the king wants dead. For Randall's slaying would fulfill one more step in an ancient prophecy predicting the rise of the Dark King of the North, and Verkain believes he is this figure, ready to bring death and destruction across all lands, to rule with a hammering fist of iron. It is in Kobalos, in the darkest of hours, alone with enemies all around, Darkbow becomes the last hope for all. But to defeat his foes, first he must learn to defeat his own rage.